Robin Youngs, Edward Fisher, Musheer Hussain, Jonathan Fishman,	The Journal of Laryngology & Otology, Volume 130 Issue 3, p 213. M Van, I Khan, S S M Hussain,	The Journal of Laryngology & Otology, Volume 130 Issue 3, pp 214-218. H Odat, S-H Shin, M A Odat, F Alzoubi,	The Journal of Laryngology & Otology, Volume 130 Issue 3, pp 219-224. 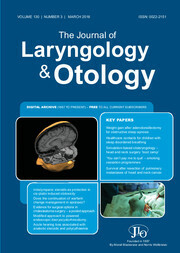 H E Özel, F Özdoğan, S G Gürgen, E Esen, S Genç, A Selçuk,	The Journal of Laryngology & Otology, Volume 130 Issue 3, pp 225-234. A T Harris, B Mettias, T H J Lesser,	The Journal of Laryngology & Otology, Volume 130 Issue 3, pp 235-241. F Fiorino, B Mattellini, M Vento, L Mazzocchin, L Bianconi, F B Pizzini,	The Journal of Laryngology & Otology, Volume 130 Issue 3, pp 242-247. S Derin, O H Cam, H Beydilli, E Acar, S S Elicora, M Sahan,	The Journal of Laryngology & Otology, Volume 130 Issue 3, pp 248-251. R Fox, R Nash, Z-W Liu, A Singh,	The Journal of Laryngology & Otology, Volume 130 Issue 3, pp 252-255. Does the continuation of warfarin change management outcomes in epistaxis patients? S Bola, R Marsh, S Braggins, C Potter, S Hickey,	The Journal of Laryngology & Otology, Volume 130 Issue 3, pp 256-260. T N Janakiram, N Suri, S B Sharma,	The Journal of Laryngology & Otology, Volume 130 Issue 3, pp 261-264. S Feng, Y Fan, Z Liang, G Yang, Z Liao, L Guo,	The Journal of Laryngology & Otology, Volume 130 Issue 3, pp 265-271. J Y Soh, M Thalayasingam, S Ong, E X L Loo, L P Shek, S S Chao,	The Journal of Laryngology & Otology, Volume 130 Issue 3, pp 272-277. A Ghosh, G Philiponis, A Bewley, E R Ransom, N Mirza,	The Journal of Laryngology & Otology, Volume 130 Issue 3, pp 278-283. C J Chin, C A Chin, K Roth, B W Rotenberg, K Fung,	The Journal of Laryngology & Otology, Volume 130 Issue 3, pp 284-290. S Hosokawa, K Funai, K Sugiyama, G Takahashi, J Okamura, Y Takizawa, T Yamatodani, H Mineta,	The Journal of Laryngology & Otology, Volume 130 Issue 3, pp 291-295. G Gudnadottir, A Ehnhage, M Bende, M Andersson, A Cervin, L O Cardell, J Hellgren,	The Journal of Laryngology & Otology, Volume 130 Issue 3, pp 296-301. H S Lee, C Park, S W Kim, J W Song, B K Chun, T J Park, J C Hong, K D Lee,	The Journal of Laryngology & Otology, Volume 130 Issue 3, pp 302-308. T Tikka, N Mistry, A Janjua,	The Journal of Laryngology & Otology, Volume 130 Issue 3, pp 309-313. H Mohammed, K West, J Bewick, M Wickstead,	The Journal of Laryngology & Otology, Volume 130 Issue 3, pp 314-317. S S Bakshi,	The Journal of Laryngology & Otology, Volume 130 Issue 3, p 318. A Kouhi, V Vakili Zarch,	The Journal of Laryngology & Otology, Volume 130 Issue 3, p 321. M R Ahmed,	The Journal of Laryngology & Otology, Volume 130 Issue 3, pp 318-320. A Taghi,	The Journal of Laryngology & Otology, Volume 130 Issue 3, p 321.